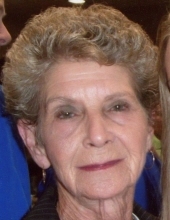 Mrs. Peggy Jean Binkley, 77, of Burna, KY, passed away Sunday, September 16, 2018 at Livingston Hospital and Healthcare Services in Salem, KY.
Mrs. Binkley enjoyed flowers, cats and hummingbirds. She is survived by her daughter, Donna (David) Bebout of Hampton, KY; sister, Shirley Bracey of Ashland City, TN; brother, Sammie Scott of Temple Hill, IL; two grandchildren, Trey Bebout of Owensboro, KY; Cyndel (Harold) of Ledbetter, KY; and three great grandchildren, Corbett, Emmery and Timber. She was preceded in death by her husband, Douglas Don Binkley; one sister; one brother; and parents, Erwin and Gean Medley Scott. Funeral services will be 1 PM, Wednesday, September 19, 2018, at Boyd Funeral Directors and Cremation Services. Burial will follow at Cedar Grove Cemetery. Friends may visit from 5 to 7 PM, Tuesday, September 18, 2018, in the chapel of Boyd Funeral Directors in Salem.